In this important survey, an international group of leading philosophers chart the development of philosophy of education in the twentieth century and point to signficant questions for its future. 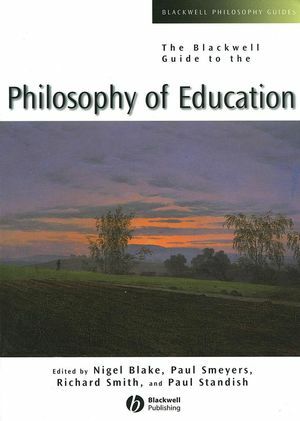 Presents a definitive introduction to the core areas of philosophy of education. Contains 20 newly-commissioned articles, all of which are written by internationally distinguished scholars. Each chapter reviews a problem, examines the current state of the discipline with respect to the topic, and discusses possible futures of the field. Nigel Blake teaches at the Open University, Paul Smeyers at the University of Leuven in Belgium, Richard Smith at the University of Durham, and Paul Standish at the University of Dundee. They originally came together to explore their shared interest in postmodern issues and poststructuralist theory in relation to education. Their first collaboration. Thinking Again Education after Postmodernism (1998), laid the foundations, for other projects, including Education in an Age of Nihilism (2000). They have also addressed the educational influence of the European Union, reform in higher education, issues of online education and of moral education in their joint projects. Paul Smeyers at the University of Leuven in Belgium. Richard Smith at the University of Durham. Paul Standish at the University of Dundee. Introduction. (Nigel Blake, Paul Smeyers, Richard Smith, and Paul Standish). Part I: Social and Cultural Theories. 1 Pragmatism and Education. (Jim Garrison and Alven Neiman). 2 Critical Theory and Critical Pedagogy. (Nigel Black and Jan Masschelein). 3 Postmodernism/Post-structuralism. (Michael Peters and Kenneth Wain). 4 Feminism, Philosophy and Education. Imagining Public Spaces. (Maxine Greene and Morwenna Griffiths). Part II: Politics and Education. 5 Liberalism and Communitarianism. (Eamonn Callan and John White). 6 Democratic Citizenship. (Penny Enslin and Patricia White). 7 Education and the Market. (David Bridges and Ruth Jonathan). 8 Multicultural Education. (Pradheep Dillon and J. Mark Halstead). Part III. Philosophy as Education. 9 The Activity of Philosophy and the Practice of Education. (Pádraig Hogan and Richard Smith). 10 Critical Thinking. (Sharon Bailin and Harvey Siegel). 11 Practical Reason. (Joseph Dunne and Shirley Pendlebury). Part IV: Teaching and Curriculum. 12 Higher Education and the University. (Ronald Barnett and Paul Standish). 13 Information and Communication Technology. (David Blacker and Jane McKie). 14 Epistemology and Curriculum. (Andrew Davies and Kevin Williams). 15 Vocational Education and Training. (Paul Hager and Terry Hyland). 16 Progressivism. (John Darling and Sven Erik Nordenbo). Part V: Ethics and Upbringing. 17 Parents and Children. (Paul Smeyers and Colin Wringe). 18 Autonomy and Authenticity in Education. (Michael Bonnett and Stefaan Cuypers). 19 Changing Notions of the Moral and of Moral Education. (Nel Noddings and Michael Slote). 20 Education in Religion and Spirituality. (Hanan Alexander and Terence H. McLaughlin).